Three years have passed since we first wrote our blog post titled ‘Is Magento the best free eCommerce platform?’. In our 2018 update, we explore the current state of eCommerce software exploring the peaks and pitfalls of the most popular platforms, including Magento. We thought it would be beneficial to look at the original post, see whether the information still holds true, and comment on whether the eCommerce landscape has changed. If so, how has it changed and who are the new kids on the block in terms of eCommerce platforms? Editor’s Note: Our original post was created in April 2015 and we wanted to take another look at the world of eCommerce and give readers an UpToDate comparison of which platforms are worth their time. You can also find the original blog below in its entirety. Choosing the right eCommerce or shopping cart solution for your business can be quite the task, particularly when there are so many commercial, free and open source eCommerce platforms to choose from. In this updated version of the blog post, we will try to give you some useful information that will help you in making a decision. When we first wrote our blog post, Magento was the standard that most new larger businesses would choose when it comes to eCommerce, especially where looking for a free or open source solution. However, in recent years, we’ve seen platforms such as Shopify, Etsy, WordPress / WooCommerce and even Magento 2 move into dominant positions in the eCommerce platform arena. We often are asked by clients ‘Which platforms are the best’ and with the risk of sounding pedantic, ‘best’ really is a relative term. For example, a platform might be great for SEO but be terrible at shop customisation and vice versa. The solutions listed below will rarely tick all of the boxes for a business looking to select the best eCommerce platform, but with the number of platforms increasing all the time, it’s becoming easier and easier to find something suitable for your requirements. Magento’s great, but what about the other free and open source eCommerce platforms? Should I use WooCommerce as an eCommerce solution? WooCommerce is another great and powerful platform that fits a wide array of usage scenarios for businesses looking to sell online. WooCommerce offers users the ability to sell not only physical products but digital services and downloads too which is congruent with their ‘no limits’ description of the platform. The platform boasts that is has a modular and highly compatible system that works well with other WordPress plugins and rightly so as at the time of this writing, WooCommerce list their official extensions to be in excess of 400 allowing further customisation and versatility to the platform. WooCommerce can also benefit from using a the large number of web design service providers available to help you through the process as it can be quite overwhelming to get familiar with the powerful features of the platform in addition to getting everything up and running correctly. Like WordPress, the platform is free and open source, so an attractive part of WooCommerce is the fact that they “don’t take a cut of any of your sales” which may be a key deciding factor for those on the fence about which system to choose. There are however optional fees with WooCommerce, one of them being the option to pay for a high-quality theme rather than using free ones. Of course, this is entirely based on what you are looking to achieve and your preference on how the store looks. Which features are missing / lacking? Currently, abandoned cart recovery isn’t a core feature but there are many advertised features such as coupon support, quality of life improvements for tax calculation, various shipping options, and the list goes on. Point is, WooCommerce is a lot of things but lacking isn’t really one of them – and where something is lacking, there is another free or open source plugin or add-on available to WooCommerce that can usually meet your requirements. Magento has been in circulation, powering many eCommerce websites since 2007 when the first beta was released. Since then, Magento has come on leaps and bounds improving many areas of the software and adding new features. Things continued to improve and Magento 2 was released in beta in mid 2015 resulting in improved features and performance. If you have a store running in Magento 1 and everything is running perfectly for you then you don’t need to migrate to Magento 2 just yet, but Magento 1 is planned to reach end of life in 2020 so you will need to start thinking about the switch. For new eCommerce stores, our recommendation would be to choose the most recent version of Magento 2 as you will gain benefits by setting up your store from scratch using the most “future proof” version of the software. For those wanting to upgrade but are worried about running into issues migrating to Magento 2, there is no such thing as a guaranteed smooth upgrade due to many variables and factors, but you should take some peace of mind in knowing that there are migration tools and service providers that will help smooth the transition between platforms. What are the main reasons for upgrading to Magento 2? There are many reasons to start upgrading to Magento 2. Here are a few to give readers an outline or which are the most significant upgrades and changes compared to Magento 1. In our opinion, every new business that chooses Magento as their platform should use Magento 2. It just doesn’t make sense to select a platform that will soon become unsupported. There are so many quality-of-life improvements as well as improving upon already existing features we know and love from Magento 1. Since we first started thinking about this question, Magento 2 has not only launched but been improved upon regularly, taking the platform to new highs in terms of security and features. The software is constantly being updated and upgraded, so having a starting point of Magento 2 puts you in a good position to easily receive new and improved features regularly. What are some of the alternative free and open source eCommerce platforms? Similar to other free and open source platforms available, PrestaShop offers a very simple solution to setting up a store. Features in place allow the sale of digital as well as physical products and the feature set covers a lot of the requested features such as custom out of stock messages and minimum order settings, and theme customisation. PrestaShop advertises itself as 100% free with no fees, although you might have to pay for some custom modules or addons. PrestaShop comes with plenty of configurable features allowing each store to be different even if they are using the default version of the software. ZenCart is another open source eCommerce solution that allows modification of the source code to completely tailor the platform to your requirements. ZenCart has a lot of the popular features you’d expect from an eCommerce platform such as easy integration with payment gateways, theme customisation, detailed product descriptions and features for running promotions such as voucher code management and discount functionality. ZenCart also has a Plugin / Addon selection which will surely cater to the needs of anyone looking to set up an eCommerce business website. OpenCart is a free open source eCommerce platform which gives users that ability to expand functionality with modules in addition to providing the ability to modify the store theme to your liking. OpenCart provides features that allow management of multiple stores simultaneously within the default feature set very easily. You can easily backup your store and have access to all the expected features such as coupons, discounts and user management. OpenCart is free but offers various tiered support plans ranging from one-time fixes to monthly premium support plans for those in need of more regular support. Are there any other shopping cart platforms that are free and open source and worth a look? What about closed source eCommerce platforms? There are other platforms which are considered ‘closed source’ or commercial eCommerce platforms that offer their own set of benefits. Two of the most popular platforms in this area is BigCommerce and Volusion. There are benefits to using a closed source eCommerce platform – typically ease-of-use for users not familiar with coding, is reported as being a benefit. Many of these solutions offer click, drag and drop interfaces, making it easier to use for newcomers. That said, many free and open source solutions can also be adapted using ‘drag and drop’ plugins, themes or templates, to provide similar user interfaces. Due to the nature of the closed source, a perceived implication is that these platforms are more secure as the code isn’t available for anyone to experiment with. Conversely, it is true that all software can be hacked and a benefit of open source is that the developer community is able find a fix much faster than many commercial providers who have limited resources can. BigCommerce is a very popular platform which offers many out of the box features that are easy for new comers to get to grips with. BigCommerce has built-in mobile store support and 24/7 telephone support for users that run in to issues with the software. BigCommerce offers an Open API which opens up possibilities when it comes to extending functionality in addition to useful inventory management tools and settings for SEO optimisation. A drag and drop interface is in place making things very simple and easy to use – a lot of new store owners are put off by ecommerce platforms that slow them down by forcing them to learn a new system. Drag and drop makes things more intuitive and therefor less time consuming compared to getting to grips with other eCommerce platforms. BigCommerce also offers various free templates and also the ability to pay for other templates of different designs with a premium look. The software also has support built in for PayPal One Touch built in which is an attractive extra for shop owners looking for unique and powerful features that are hard to find anywhere else. One negative that we’ve heard if that BigCommerce has annual sales limitations that might be worth looking into if you are considering going with the software. Out of the box, Volusion offers responsive website features in addition to another simple and easy to use content editor which is great for users new to the world of running a website / web store. As you’d expect, Volusion has many of the typical standard eCommerce features such as built in promotional tools and categorisation features, abandoned shopping cart management and great support. Paid themes are also a great option for users, some high-quality store themes can be purchased and are absolutely worth the investment for the professional appearance it gives to your store which can obviously help with being seen as a trustworthy place to buy from. There are no transaction fees with this software as long as you have your own payment gateway. Volusion also provides the ability to input basic meta data and standard SEO features but nothing too in-depth or powerful. Wix is another ‘closed source’ platform which has gained recent popularity amongst store owners. Similar to other closed platform solutions, a drag and drop interface is present for ease of use and is optimised for mobile by default. The Wix editor does a good job of making a sleek looking website in hardly any time at all which is great for store owners that are desperate to get something live as soon as possible without sacrificing site aesthetic in the process. Wix offers a solution for users wanting to add a regular blog to their store with the ability to schedule blog posts, and featured posts and tag clouds as you’d expect in most other WordPress type blogs. The platform also offers SEO tools allowing the editing of meta data, URL editing and the integration of analytics features that helps track how your site is performing. 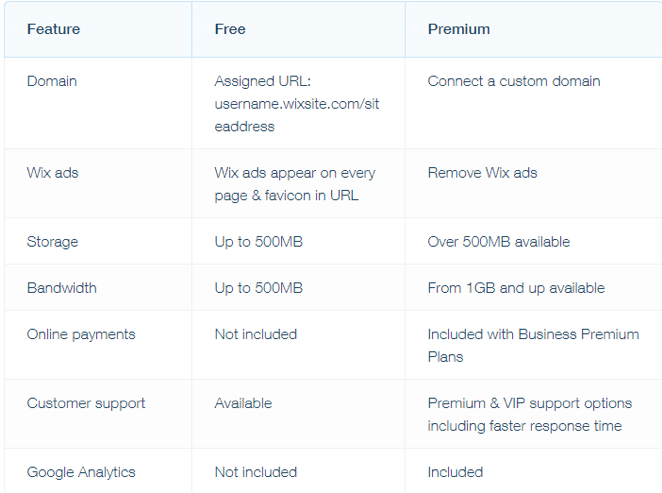 Although not open source, Wix is free but offer ‘professional’ features within a premium plan. There are a few significant differences between the free and premium plan that you can see in the table below. How does Etsy hold up as a shopping cart solution? Focusing mainly on handmade / vintage items, Etsy has grown in popularity in recent years and has been widely accepted as the ‘go-to’ solution for many businesses that sell within the ‘handmade’ niche. Due to the convenience of being able to have a template store created for you to start selling with minimal hassle, Etsy will create your store for free but charge a fee for every item listing that is present on the site in addition to a 5% fee of every item sold on the store. There are also more ‘hidden’ fees that you will run into along the way too which is never a welcome surprise. This can put users off but the knowledge of having a pre-made store removing the need for technical knowledge and the associated cost is situationally appealing to many sellers and businesses. 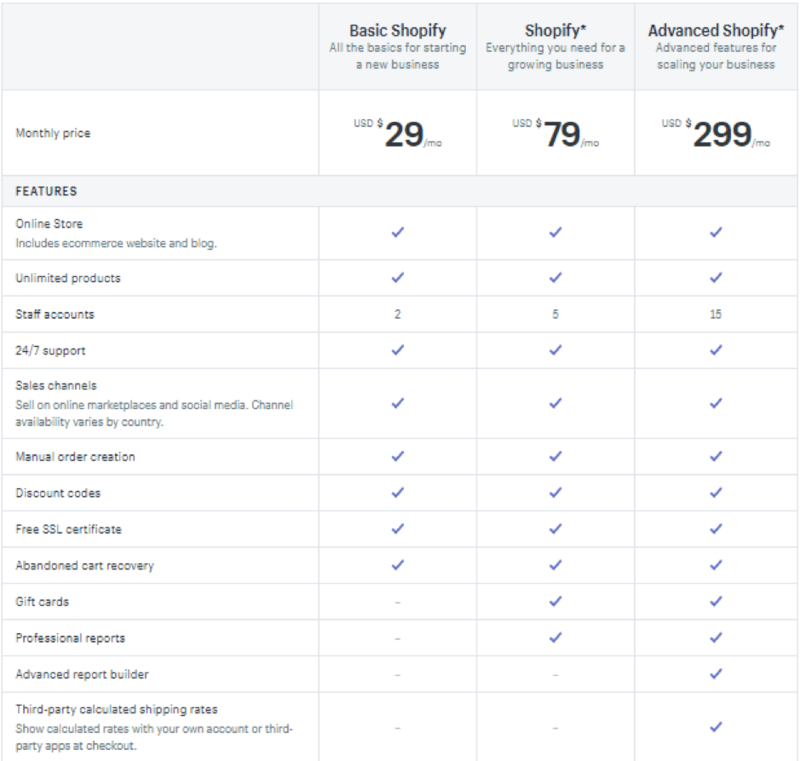 How does Shopify compare to Etsy? Shopify offers various packages for users and caters for a wide range of seller types and businesses. There are three main packages to choose from, regardless of which package you choose, you will still gain access to the blog and website functionality. The key features the higher tier packages offer a more in-depth reporting function and access to more analytics data which is ideal for established businesses whereas the lower-tier packages are ideal for newer businesses looking for basic features and lower pricing. Shopify was built specifically for eCommerce and gives easy access to basic SEO tools allowing the input of various meta data that makes it very easy for sellers to optimise their content with limited SEO knowledge and no coding experience. Selling fees on this platform still apply with transaction fees in the region of 2% for a basic plan user, 1% whilst on the Shopify plan and 0.5% on the advanced plan. As you can imagine, the downside with basic membership is mainly the limited reporting and analytics as well as the increased transaction fees, which, might not look like a lot but it adds up quickly and can be frustrating. Support seems solid for the most part as 24/7 support is available across the different membership tiers. One big positive is the fact that Shopify has apps utilising its API which can provide many new features from helping with abandoned carts to countdowns and other various addons that solve many issues sellers are familiar with and make it very convenient by adding general quality of life improvements. What about other eCommerce technologies and languages? So far, we’ve mainly covered PHP based solutions but there are other programming languages that are used to create eCommerce platforms. Hybris is a Java based eCommerce framework utilised by some big names including Vodafone, Levi’s and Samsung. Hybris offers both scalable marketing tools and commerce solutions and is definitely worth considering as an alternative to PHP based platforms. In terms of cost, Hybris has chosen a quote-based licensing plan so in order to find out just how much you’ll have to pay, you will need to contact the software vendor. NopCommerce offers a free Open Source mobile friendly scalable eCommerce platform containing many of the useful features that can be found in more popular competing platforms such as multi store support, marketing promotional features and more. Although the software is free, they offer the option of web designer services direct for people that want a hands-off approach when it comes to the construction of their site. Umbraco offers a great eCommerce solution in its uCommerce product. It is felxable and offers the ability of being able to create with relative ease. Umbraco has a tiered pricing structure offering Free, Pro or Enterprise. Unfortunately in the free version of lot of key features you can find elsewhere for free are held back such as product reviews, product ratings and more. Does Virtual Reality (VR) need to be a factor with how fast this is taking off? As IKEA has shown us previously, one great thing about Virtual Reality is that you aren’t alienating none-VR compatible customers by offering VR experiences.Virtual Reality experiences can be flashy and immersive even without a compatible headset. As we mentioned in our vCommerce article, IKEA’s integration of VR with their store allows users to simply drag a mouse around to change viewing perspective in their store as well as the option to click and move around. It really is a win-win integrating a VR compatible section of your store. It’s still very early days for VR within eCommerce but the future is bright and you can expect more stores to be utilising the possibilities of VR as time goes on and the install base grows. So, is Magento the best eCommerce platform? How does it compare overall? In my opinion, yes Magento is the best eCommerce platform available! Generally speaking, it’s the most powerful eCommerce solution available due to its flexibility and versatility as a platform with little compromise. Many of the previous eCommerce platforms mentioned are great in certain capacities but in terms of overall flexibility, scalability and architecture, Magento 2 is the clear winner. Compared to other solutions, Magento as an eCommerce platform seems to have all the right boxes ticked covering a wide range of typical user requirements. Obviously, there are times when your main requirement may be fulfilled by another platform but for most store owners that are starting out, Magento seems to have all bases covered with room for scaling into their enterprise-tier package without initially pricing their users out of the market. Services like Etsy or Shopify may be better for users that just want to quickly get started and have a somewhat simple web builder that lets you get up and running fast, whereas Magento offers a more powerful solution allowing you to really hone-in on the features or functionality you are looking for. Again, ‘best’ is a relative term – it really depends on what you are looking for and how you are looking to do it with regards to eCommerce platforms. What’s the Catch and is Magento really free? One of the big problems with Magento is the learning curve associated with familiarising yourself with how to use the system. In addition to that, you’ll need to configure it which can be quite problematic for businesses that aren’t familiar with website design, coding and hosting for example. Typically, Magento requires (or benefits greatly from) coding knowledge and usually results in the need for an eCommerce agency such as Opace to assist with setting up and implementing the software correctly. Then, shortly after, a training course would be recommended to allow you to learn how to add new listings and utilise the typical day to day features you will come to love. Magento is very versatile purely due to the way it is made. It can be daunting to users not familiar with the installation of content management systems or website maintenance in general. If you can manage to get past the complexity and familiarise yourself with the features Magento has to offer, you will rarely want to switch to an alternative platform due to how powerful Magento is. Like the other platforms, Magento offers varying versions of its software at different price points depending on how you want to utilise the platform. The significant differences are that Enterprise offers improved and robust security features and generally more enhanced features whereas the free version (Community Edition) has the same core as the paid version and with the right choice of extensions can be just as feature-rich. Editor’s Note: Three years have passed since we first wrote our initial blog post. We wanted to add to it and give readers and UpToDate comparison of which platforms are worth their time. You can find the original blog below in its entirety from April 2015. Are you currently trying to decide on the best ecommerce platform for your business? With so many different choices available, it can be a tough decision to make. Our years of experience in web development has taught us many things, one of which is that Magento is the best free ecommerce platform out there. Below we’ve shared some of the main reasons why it tops our list. We don’t know about you but we don’t think that over 238,000 sites would be using Magento (as of February 2015) if it didn’t live up to the hype! The ecommerce platform is one of the most popular in the industry, used by business of all sizes, including the likes of Nike, Rosetta Stone and Harper’s Bazaar. Another reason why we love Magento is because it’s open source. Aside from being free to download (which is obviously fantastic) it can be customised and extended as much as you like. The ecommerce platform also boasts an active developer community, which openly share ideas, make improvements to the platform and help other users. If you know anything about online marketing, you’ll know just how important SEO is to your business. The great news is that Magento is very search engine friendly. By allowing you to optimise your title and meta descriptions, image alt tags and URLs, it gives your ecommerce site a good chance of ranking well in relevant searches. Magento is a SEO-friendly ecommerce platform. As we previously mentioned, the platform is highly customisable and the way business owners can make their sites unique is by using Magento extensions and themes. There are hundreds of extensions and themes available, some of which are free, others that you have to pay for but basically they make anything possible. Whether you’re looking to integrate your online store with social media or add customer reviews, Magento extensions make it easy. Along with themes and extensions, Magento can also be integrated with a wide range of third party applications including Amazon, eBay, FedEx and PayPal. The platform’s opens architecture makes integrations simple and allows businesses to benefit from multi-channel selling and other seamless solutions. With so many security scares over the past couple of years, it’s understandable that business owners require a highly robust and secure ecommerce platform and really, there’s no better than Magento. Coupled with a strong security strategy, the ecommerce platform will use its CAPTCHA functionality, SSL security support, restricted admin access and custom admin paths to prevent hackers from penetrating your website. 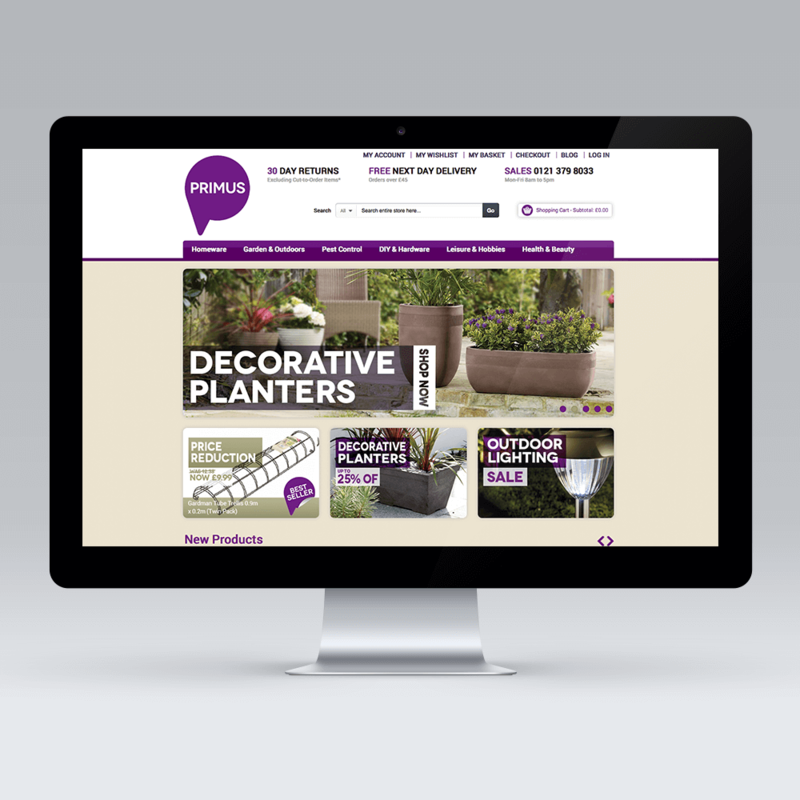 Another reason why we recommend Magento to our business clients is because it’s fully responsive and mobile friendly. It allows you to build ecommerce sites that are compatible with all devices and prevents you from having to worry about being penalised by Google for non-responsiveness. You can find out more in our responsive web design infographic. Unlike many other ecommerce platforms out there, Magento is also capable of handling multiple versions of the same site. This means you can build sites with multiple languages, currencies and tax rates to meet the needs of your customers around the globe. As you can see, there are many reasons why Magento is the best free ecommerce platform available. Unlike other platforms out there, Magento is first and foremost an ecommerce platform, so if that’s what’s more important to you, it’ll tick all the right boxes. For more information about Magento or our web development services, feel free to get in touch! If you found this blog useful you can follow us below to get the latest as we release more useful Magento blogs over the coming months!